“This moustache kills fascists” proclaimed the T-shirt of a skinny, excited-looking kid waiting in a very long line outside Rotunda to see Gogol Bordello on this damp Wednesday evening. What a catchphrase; and indeed, what a good description of what Eugene Hutz, the boisterous Ukranian/American moustachioed front man of this self-proclaimed “Gypsy Punk” band, stands for. Multi-talented (he’s starred in two films and is also in Madonna’s new film Fifth and Wisdom, Hutz is the focal and spiritual centre of the band. 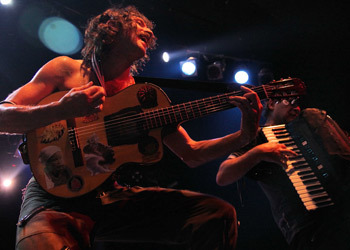 Who and what are Gogol Bordello? Why are they? Well, in a nutshell, they are a kind of international collective, a cultural melting-pot of a band based in New York, but with members from places as eclectic as Ukraine, Israel, Romania, Ecuador, the U.S, Ethiopia and Russia. With five records already under their belts, they’ve been together in one form or another for 10 years; their trademark is melodic but chaotic Eastern European-influenced folksy punk rock music, mainly sung in the singer’s native Russian language. Hutz claims that the band acts as shamans in modern rock and roll, serving to channel energies through their being and unlocking energies in others; that he wants the band to try to triumph over existentialist philosophy (which he has always hated) – so, at the very least, a hedonistic night of fun was in store. Judging by the number of people rammed into Rotunda, it seemed as if the party season had started early. DJ Andre warmed the crowd up with a lively set; having toured with Gogol Bordello for some time, and spinning remixes of the likes of the Clash and The Pogues, his grooves were in tune with the punkish crowd, though the chants for “Gogol” started well before the end of his set, and every time one of the band members skittered across the back of the stage, a huge roar went up, probably to the chagrin of the man on the decks. The band, named after Hutz’s literary hero who smuggled Ukrainian culture into Russia under the radar, in the same way aims to smuggle Gypsy/Eastern culture into the American and European mainstream. They bounded onstage shortly after 9 pm, each one lapping up the adoration of the crowd. Average age of the band: about 45. Eugene, last on, sporting a bandana and clutching a bottle of red wine and a heavily-stickered acoustic guitar, saluted the crowd before launching headfirst into “Supertheory of Supereverything”, with the sold-out crowd responding by stomping in delight, and hardly a space to stand without being barged or knocked, leaving dancing (or leaping around madly) as the only option. Each song melded into the next, and the band only paused for breath after the fourth or fifth song, when Hutz briefly cheered the audience and told them how great it was to be in Poland before hurling himself into “Alcohol”, a tribute to that which keeps the fabric of his band together, it seems. “Ultimate” followed, a breathless kind of punky stomp which unravelled for three minutes in a whirl of fiddles and accordions, then “Think Globally, F*** Locally”, an insane four minutes of kitschy protest singing. A slight pause for breath and a message to the crowd in his endearing Russo-English accent: “I love you guys, but be careful” – pointing to a guy who was lying prostrate at the front after a bout of crowd surfing – “you’ll end up with a broken shoulder like me!” The breakneck set resumed with “Start Wearing Purple”, a clear crowd favourite and probably the moment of the night as literally the whole of Rotunda rocked to the catchy but frankly ridiculous song: “Start wearing purple, wearing purple for me now / All your sanity and wits will vanish, I promise / It’s just a matter of time.” Which, in all probability, it is. It is impossible not to get swept along by the sheer conviction and fury of it all. Hutz, more of a demented ringleader than a frontman, creates a white-hot energy onstage which is perfect synergy to the ludicrous hilarity of the music. Seeing a brightly illuminated stage crowded with people clearly loving what they do cannot but impress you, regardless of whether you actually like the music itself. The band went off after 90 minutes, only to return for a four-song encore which started with an acoustic solo from Hutz and ended up with the whole band, including newly-recruited South American percussionists, dancing and leaping around the stage in happy abandon, the infectious energy Hutz created having seeped over the stage, the audience and even those standing on the balcony above. An ecstatic and sweaty crowd showed their appreciation for several minutes as the band trudged off. It seemed they would have been happy to play through the night and continue the party into the (alcohol-soaked) small hours. Gogol Bordello are, it has to be said, an exceedingly silly band. There is more than a little ridiculousness to what they do, and listening at home does not rival their live performance; but what a live proposition they are. It sure as hell beats watching Coldplay stare at their navels. In the mangled words of Sasha in the film Everything Is Illuminated – in which Hutz stars – they are a most premium band, and they performed recklessly well. Thank Gogol.